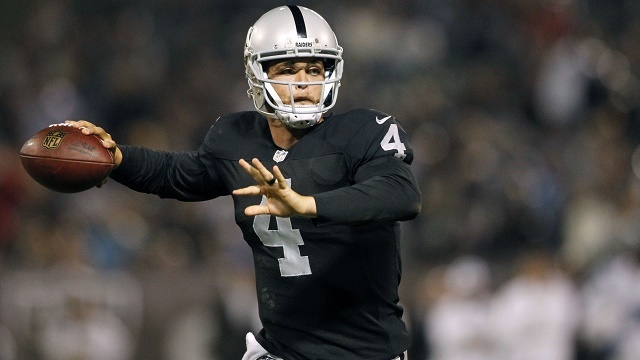 Derek Carr and the Raiders desperately need a win after starting 0-3. In my first week picking NFL games in a rather-uninspiring manner, I went 9-4… against the spread, that is. So, playing with house money, I might as well round out the week with one final pick, for Monday Night Football. Let me also throw in a side note. Why is the game in Mexico City if the teams are literally being told to not leave their hotel rooms? Is the NFL so pathetically desperate to spread its seed outside the U.S. that it would force-feed Mexico City fans one measly game in spite of potential dangers to the all of the players, coaches, and staff members involved? The Texans’ point-differential far belies their 6-3 record, making me believe it’s only a matter of time before this 1-3 road team starts to really crumble. The Raiders are making believers every week, led by 2014 Draft sensations Derek Carr and Khalil Mack. Brock Osweiler and Co. have wilted under the bright lights of primetime football this year, at least against top-tier teams like New England and Denver. Here is thinking that trend continues south of the border tonight. Pick: Raiders. Be the first to comment on "Room for one more… NFL Pick"